Want to send a little something extra with your flowers? Take a look at our selection of small gift additions such as sparkling wine, bright balloons, chocolate and candles. *PLEASE NOTE: The pictured bouquet and price is specific to Sydney Metro, Melbourne & Brisbane flower deliveries. 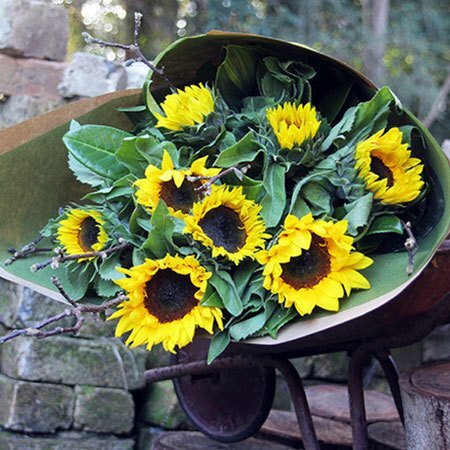 For sunflower deliveries outside these locations, we recommend giving our consultants a call toll free on 1800 66 66 46 or emailing us directly at sales@flowersforeveryone.com.au. Our team will be able to provide a quote and check availability of sunflowers in the location you wish to deliver. 2016-10-17 Beautiful sunflowers delivered without issue.